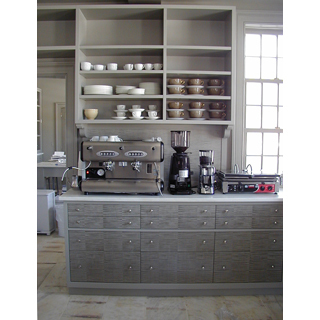 A new kitchen and servery in a new, but carefully crafted, colonial house. The kitchen needed to be practical, function exceptionally well, and work within the clients particular aesthetic and with that of the house. A simple palette of white Vermont marble, gray lacquered woodwork, custom dyed veneer panels, and brushed nickel and stainless steel. All appliances were left apparent, in a more matter-of-fact manner. Occasional whimsical details were inserted to integrate the otherwise very modern lines and profiles with the more sculpted details of the house.